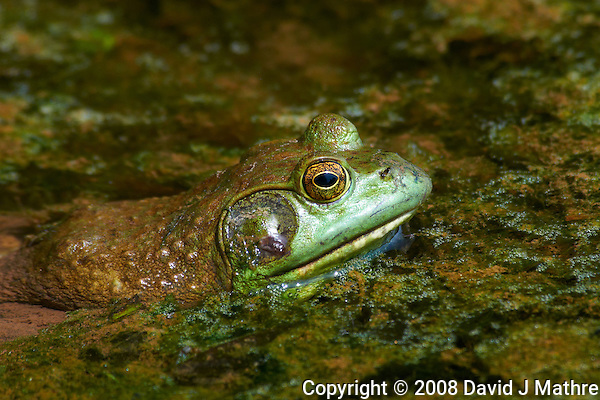 Image of a bullfrog at the Sourland Mountain Preserve near my home in New Jersey. I found this when going back are reviewing some old images. I realized that it was a very productive day, and that I have a lot of other images from the day that I should publish — wildflowers, butterflies, bees, and dragonflies. I need to check the location out this weekend to see what is present this year. Bullfrog at the Sourland Mountain Reserve. Early Summer in New Jersey. Image taken with a Nikon D300 and 80-400 mm VR lens (ISO 500, 400 mm, f/8, 1/250 sec). Raw image processed with Capture One Pro, Focus Magic, NIK Define 2, and Photoshop CS5.